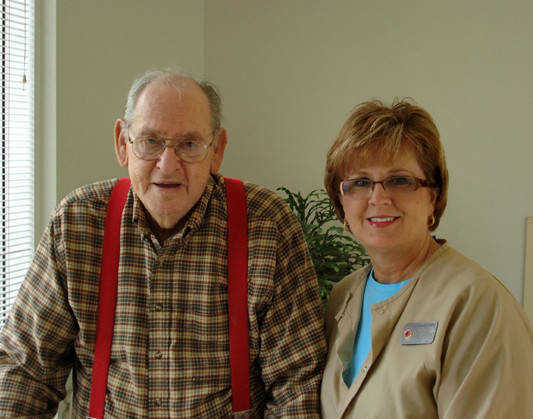 Maria Hanschen, Director of Nursing Services at The Missouri Veterans Home, with Charles Shultz, an Army Veteran who served during the Korean War. Waiting at the airport to fly out to see my son, I have time to people watch, which is one of my favorite past times. I watch a small group of soldiers; coffee cups in their hands, and lugging heavy olive green duffels- back from deployment or maybe on their way. Their young faces and camouflage uniforms make me think of the residents I care for each and every day at the Missouri Veterans Home, in Cape Girardeau, MO. I have been Director of Nursing Services there for almost 19 years and the men and women I serve, all Veterans from WWII, Korea, or Vietnam were once, young and strong like the heroes in front of me. Forty, fifty, or sixty years ago, my residents were traveling to a far off place to answer the call for their Country. It has been a privilege for me to be a part of this community of Veterans. These Patriots, as they are known in our home, are again away from their homes. They are not in a foreign country, fighting for our freedoms, and they are no longer enjoying the freedom of good health and living in their homes. This time, they are fighting hopelessness, helplessness and boredom in a long term care facility. Each day, from day one, after they are admitted, we are dedicated to keeping them engaged in life and with others. Fishing, St Louis Cardinal Baseball games, BINGO, Casino trips, cook outs, shopping, and to even to flying kites, we fight to keep them wanting to be part of LIFE. They come here to LIVE, not to die. The amount of time they have left to live is not my or my staff's decision: however the quality of life we provide for them is not only our job, but our duty. Our throng of passionate volunteers, that numbers over 22,000 hours last year alone makes it possible for our Veterans to have special care. These wonderful men and women read to our Veterans; help with mail; help with outings and even help our Patriots not burn the marshmallows on the sticks at the cook outs. Quality has been a standard at this facility since I opened the home, June, 1990. Our nurses stay current with the latest technology and evidenced based practice. I have personally been in long-term care since 1980, and have always felt it was my obligation to ensure that the standards of the industry were raised to the highest level possible and have demanded that my community of professionals ensure quality to all geriatric residents living in LTC's. I understand how important it is to have consistent and persistent quality care and how it enriches everyone's lives, not only the residents. I could never allow my staff to settle for "getting by" with care. We have always given individualized care even when it was not popular in the private sector. My residents are to be bathed daily if they wish, and can eat a sandwich any time of day or night, if they want one. The Missouri Veterans Commission demands resident focused care, and we have always felt our residents earned the best we could offer them. Not everyone is fully prepared for the personal attention I expect, and strive to foster between my staff and our residents. Many will tell stories of me getting upset when a resident is served a warm tray, cold. I have asked many new employees, "would you want your father to have cold food? Then why would you want some else's father to have cold food?" Adjustment to our home and to our quality is not always easy for new staff. You learn bad habits in other places, and here, well, you are just expected to do the right thing for these men and women who put everything in their lives on the back burner, to protect us. Our residents are not placed in PJ's before dinner. They are dressed as they wish to be dressed, most often, appropriately for dinner, just as they did when they lived at home. Our residents are encouraged to stay up after supper. We do not want anyone laid down for bed until a reasonable time, unless they have major health issues, or they or their families have requested it. It is so much better for them to enjoy BINGO, TV, cards or what ever the activity might be that evening, vs. lying in bed, in a darkened room. I often have been asked if there are any special things we do to honor our Veterans that might be considered unique. The most emotional and special thing we do is to celebrate our Patriot's life when he/she dies is a "Hero's homecoming". We decided years ago, that our residents come to us through the front door, and that they should leave through the front door as well. When one of our residents passes away, we announce over the intercom, "There will be a Hero's Homecoming for -------- in 5 minutes". This allows for staff, visitors and residents to line the halls to honor the resident who has died. Taps is played, and the residents themselves stand at attention, and say a military prayer. The family is given the Patriotic quilt that covers the body as it passes through the halls to the front door. It is a very moving experience, even if you do not know the resident. Families can see that their husband, or father or brother or uncle or grandpa was loved and honored. I have so many special memories of the past men and women I helped care for. Most of them became dear to my heart. As a nurse and a manager, I understand disease process and its effects on our bodies and that we all will die. But, I have cried a few tears for many of them when they departed this world. It is hard to love someone as a friend and not miss them when they leave, even if I know it is in their best interest. As I look up, I notice the last of the group of soldiers boarding their plane. A sense of pride comes over me- yet I am not sure exactly why. Am I proud of these men and women who are flying to some distant reaches of the world to protect my freedom? Am I proud of the fact that I am part of a community providing excellent care to Veterans of times past? "Yes" I realize is my answer to both questions as I walk down the jet bridge to my plane. However, as I take one last look at the camouflage and shining laughing faces, I realize the true answer, I am proud that, like them, duty is expected, but service is a choice, and exceptional service is a privilege.